Arthur Phillips is a novelist, the author, most recently, of the novels The Song is You and Angelica. He is also both the author of the novel The Tragedy of Arthur and, metafictionally, its main character and narrator as well. Both are from from Minnesota. Arthur, the character is married to an Eastern European supermodel, twin to bipolar lesbian Dana, and son to Arthur senior, a failed painter, often-caught forger and general conman with a deep and abiding love of Shakespeare, who has spent most of Arthur's life in prison. Early in Arthur and Dana's life, when their father was still home more than he was incarcerated, he worked hard to instill in the twins his own love for the bard. Dana took to Shakespeare like the actor she would become, Arthur not so much. Arthur, in fact, will spend his whole life resentful of what his father has done and skeptical of all the things he cares about. Late in his father's life, just before he is to be released from prison for the last time, he gives Arthur a gift of sorts. He hands him the means of obtaining a centuries-lost unknown play by Shakespeare called The Tragedy of Arthur, which came into his possession illegally fifty years earlier, when he'd been working as a painter "duplicating" paintings at an estate in England. 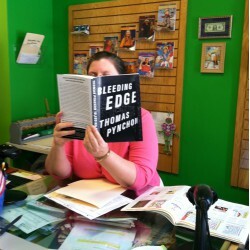 He wants Arthur to have his publisher, Random House, authenticate and publish the play. Arthur is skeptical, but also yearns to believe his father has finally done something worthwhile. He tentatively comes to the conclusion that the work is genuine, especially when a preponderance of Shakespearean scholars and other experts give their blessing to the project. But that belief is short-lived; he knows his father, and ultimately comes to believe that this play is the biggest con of his father's life. Meanwhile, Arthur's own life is no comedy in which all's well that ends well. His marriage is going down the tubes, critics find him sometimes boring and often pretentious, and he's in love with his sister's lover. 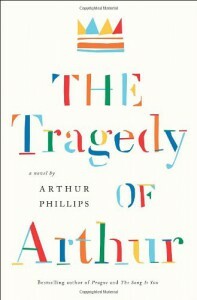 Most of the novel The Tragedy of Arthur consists of the character Arthur Phillips's introduction to the Random House publication of the play. It is 256 pages of memoir, hand-wringing, whining, blame casting, and trying to convince potential readers of the play that it is indeed a forgery. It's glorious. Shakespeare, despite Arthur's detestation of his work, is everywhere, in quotations, biographical references, and parallels to contemporary life. The last 100 and some pages contain the text of the play which in my not very well educated opinion reads pretty much like one of Shakespeare's own. Often funny and always smart, The Tragedy of Arthur is an erudite tour de force.